There are 2 reviews for 'Symphony of Eternity'. Looks a bit primitive, but well worth playing. And here it is: The first Kemco game I truly enjoyed, as opposed to just going through because it scratched the “short RPG” itch. On the surface, there’s not much to it. It’s pretty ugly (except for a number of well-drawn bosses) and if you try to go anywhere besides where you’re told to go for the plot, you’ll simply be told that you can’t go that way. But, the more I played it, the more I liked it. The plot featuring a human and his golem pal finding a princess who escaped from a bloody coup at the castle and assisting her was simple, but entertaining. The dialogue wasn’t overly wordy or intrusive. Characters gain books by which they obtain classes, each with their own skills to master and there’s a really nice level of challenge. The sort where you have to use resources to win battles and move strategically against bosses; where you feel like you’re being pushed, but not in anything resembling a near-impossible situation. Instead of random battles, enemies appear as sprites in dungeons, so you choose to either kill them all, or simply run past them. This also allows for preemptive strikes if you can run into them from behind (with the reverse holding true if you let them do the same to you). Like most World Wide Software games, the dungeons are short and simple, but that didn’t really bother me because I simply had a good deal of fun with this game. 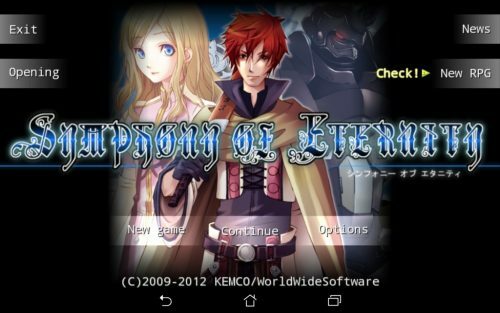 It might be one of the oldest Kemco mobile games on the market, but as long as you can overlook the often-crude and primitive visuals, this one is well worth your time! Fun, fair challenge where it's not too easy nor too hard. Visible enemies instead of random encounters. With the exception of bosses, this game is pretty ugly. Forced linearity, where the game simply tells you that you can't go to certain places until the plot takes you there. I played this game after Symphony of the Origin, and recognizing that this one comes before “Origin,” I have to factor in that the graphics and the battle system in this game are not quite as good as they are in “Origin.” Still, this game was a lot of fun, and I felt it had a good story line. Took me around 20 hours to finish this game, which wasn’t bad, but it could have been 2 hours shorter and I wouldn’t have minded. One thing that REALLY annoyed me – little trees and rocks, etc. in the path that you don’t always see and that you constantly get stuck behind. You’re like, “I’m tapping over here, but I’m not moving. Why? Oh, right, there’s a dumb rock in the path.” Other than that everything was good. Is there anything to do in Snowcross Town?